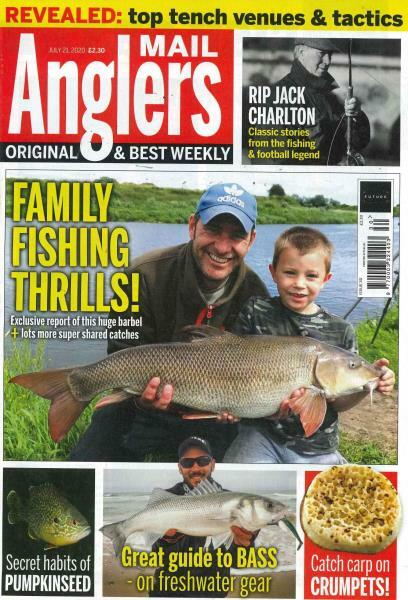 Anglers Mail is the perfect read for the carp and pike specialist. Buy a single copy or subscription to Anglers Mail magazine. Combining all the latest news and views from the coarse fishing world, articles from angling experts and contributions from a loyal and knowledgeable readership, this is one weekly magazine not to let off your hook. Things move fast in the fishing world – both literally and metaphorically – which is why staying up-to-date with the latest information and guidance requires the help of a weekly publication with its finger on the pulse of the fishing community. With an magazine subscription readers can achieve just that. Complete with match fishing results, reviews of bait, tackle and locations, it should be your first port of call before heading down to the riverbank. Established in 1964, Angler’s Mail has now been serving the angling community for the best part of 50 years. Maximise your haul with the help of star columnists written by the likes of big angling names such as Gary Newman and John Bailey, Colin Davidson and Dr Stuart Clough. As an avid reader of anglers mail i have bought every weekly issue for the past 2-3 years and am running out of storage space. I love the where to fish reports and am eager to know the best spots to be heading for good fishing. as a stillwater and river fisherman the range anglers mail covers is excellent. Sad to see the fish on five show go but cant let that good spirit. Tim Knight and everyone else behind the scenes keep up the good work fighting for our sport against the dirty anti's. I always buyt it - its very good, and it gives u good tips and advice for rigs.